A spacecraft that could take off from a planet, rendezvous with an object in orbit, and fly back to the surface like a glider. The Nautilus, a passenger spacecraft, was in orbit around Venus. What was the best way for a passenger like Don Harvey to get to the surface? A shuttle would be launched to catapult from the surface, her ramjets would take hold and she would climb on her wings, reaching in the thin, cold heights of the upper stratosphere speeds in excess of three thousand miles an hour. There, as her ramjets failed for want of air, her rocket jets would take over and kick her forward to orbiting speed of around twelve thousand miles an hour and permit her to match in with a spaceship. A nice maneuver! It required both precise mathematical calculation of times, orbits, fuel expenditure, and upper air weather, and piloting virtuosity beyond mathematical calculation - but it saved pennies. Once the shuttle was loaded at the spaceship it was necessary only to nudge it with its rockets against the orbital direction whereupon the shuttle would drop into a lower orbit which would eventually intersect the atmosphere and let the pilot take a free ride back to the surface, glider fashion, killing his terrible speed by dipping ever lower into the thickening air. Here again the pilot must be an artist, for he must both kill his momentum and conserve it so that it would take him where he wanted to go. The United States started designing the similar Space Shuttle starting in 1968, before the successful moon landings of the Apollo program. 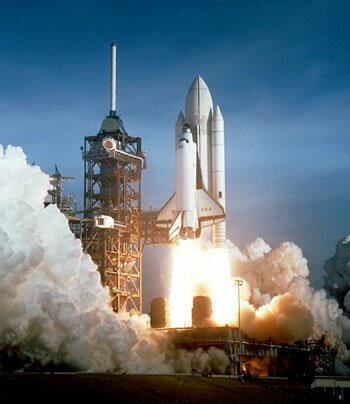 The successful launch of the Space Shuttle Columbia in 1981 is shown below. Note that in Heinlein's "design" the shuttle ship uses a catapult to reach ramjet speed; rocket engines are used only in the last part of the launch. The actual Space Shuttle uses a large external fuel tank with solid fuel boosters to reach orbit. See articles on the Space Shuttle, ramjets and finally a proposed catapult system, the Launch Ring Magnetic Launch System . Thanks to Larry for pointing this one out, and supplying the references. Compare to this entry, the first use of the phrase "space shuttle", in Hell Ship of Space (1940) by Frederic Arnold Kummer, Jr..